I don't know about you but it is time for three of my favorite things. Fall, planners, and PUMPKIN SPICE LATTES!!!! I took the opportunity to document my favorite season in my planner, noting my very first #PSL of the year. First I did a little work on my monthly tab to make it look a little more on the Autumn side. I raided my craft room stash on an effort to think out the hoarded supplies and jazzed up the page a little. I love the way it turned out! 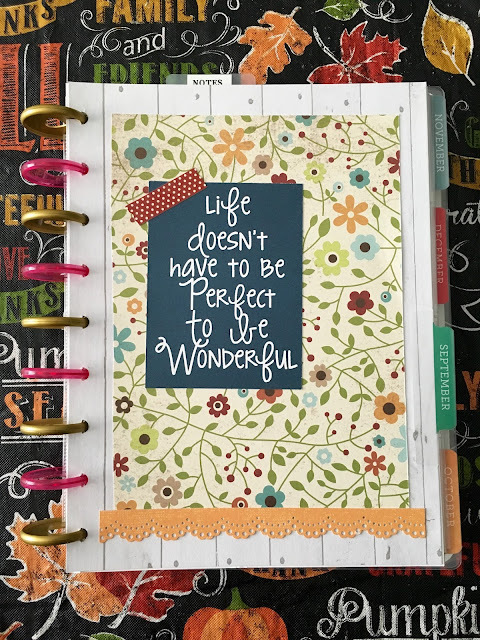 So the tab was done and I was ready to move on with Fall when I decided I wanted to add some fun photos of the month to my planner pages. I took this pic at Target Starbucks while shopping with my kiddos. I printed out the picture of the Pumpkin Spice Latte sign and adhered it to the planner box on the day I purchased. Cute huh??? I also added a sticker and some journaling to the corresponding calendar page. This is so fun to do! I am definitely going to so more of this type of memory keeping. I hope you enjoyed seeing how I am going to start using my planner. Come back and look for more crafty fun soon!